If you're looking to add some variety to your fruit bowl, consider red bananas. They're available year-round in supermarkets and specialty stores. Use them as you would yellow bananas -- eating them raw, slicing them into fruit salads or baking or frying them. While tasty, these purplish bananas are also nutritious, providing you with vitamins and minerals as well as fiber. An average red banana weighing 99 grams has 90 calories and no fat, according to the Centers for Disease Control. It has 23 grams of carbohydrates -- 8 percent of your recommended daily value. Of these 23 grams, 16 grams are sugars and 1 gram is dietary fiber. A red banana, therefore, provides 4 percent of your recommended daily value of fiber. It also has 1 gram of protein. Under their purplish skins, red bananas hold a significant amount of the vitamins and minerals your body needs every day. A 99-gram red banana has 2 percent of your recommended daily value of vitamin A and 15 percent of vitamin C. It has no sodium or calcium but gives you 2 percent of your recommend daily value of iron. 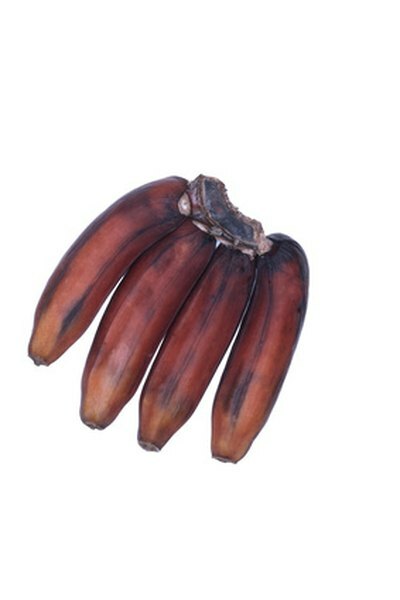 Red bananas also provide vitamin B6 and potassium. Compared with yellow bananas, the bananas most often seen in U.S. markets, red bananas tend to be smaller. Their peel is a deep red, maroon or purple hue and their flesh is a creamy whitish-pink that often tastes of not just banana but raspberry. Nutritionally, both yellow and red bananas are valuable fruits. At the market, look for bunches of red bananas that are fairly firm, with no bruises, breaks or blemishes visible on the peel. Bananas with a deep purple color are ripe. Grocers in the United States often import their red bananas from Costa Rica. Once you bring them home, leave red bananas out at room temperature to ripen, if need be. Turn them occasionally. Do not cover or refrigerate them. Dole: How Many Banana Varieties Are There?